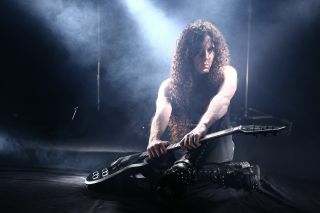 Online musical instrument marketplace Reverb.com has partnered with Marty Friedman to sell nearly 20 instruments and other pieces of gear used by the guitarist throughout his career. The Official Marty Friedman Reverb Shop launches on Tuesday, October 23. Fans can preview the items that will be available in the shop here. Among the many items featured in the Shop are several Crate amplifier and amplifier half stacks that Friedman used on every Megadeth tour and recording from 1993-1999. “These are the amps responsible for my sounds back then,” Friedman said. · A Black 1999 Gibson Les Paul Standard electric guitar and a Black 1999 Gibson SG electric guitar that Friedman purchased in the mid-Nineties after recording two Megadeth albums with producer Dann Huff and playing several of his Gibsons. “I used them on tour quite a bit. I’ve also done a lot of recordings with them in the late Nineties,” Friedman said. · Several traditional Japanese musical instruments, including a shamisen that Friedman used for the solo on “Nastymachine” from his fifth solo studio album, Music for Speeding, and a koto. “Japan has always been a big influence on my writing and playing, even before I moved here. It’s been a big force in my music altogether,” said Friedman, who has lived in Japan for the past 15 years. · A Tech 21 Trademark 60 amplifier that Friedman used on many recordings throughout the Nineties. The Official Marty Friedman Reverb Shop launches Tuesday, October 23. Check out some of the items below, or go here for a full preview.